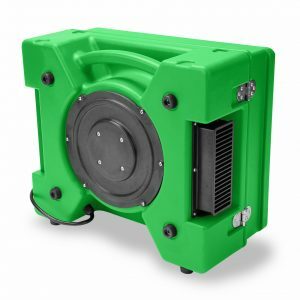 For two decades, B-Air® has developed and manufactured water damage restoration equipment like air movers, dryers, blowers, commercial dehumidifiers and ventilators for industry professionals. B-Air® prides itself on creating the highest quality products to supply the needs of the ever changing and evolving industries it serves. B-Air® products are designed and engineered in California ensuring attention to detail and the highest standard of quality. We offer a wide range of commercial air movers, commercial dehumidifiers, and air scrubbers for professionals; including water damage restoration, fire damage restoration, and mold remediation contractors. Picture yourself pulling the fully equipped, fully loaded Ultimate Drying Station up to a customer’s door. Now imagine the impression you will make as your customer discovers the personal details of the custom wrap, the mag wheels, the professional equipment and the diamond plate design. You are a professional contractor; it’s time to show it! Your Ultimate Drying Station | UDS-76 Trailer has the capacity to organize and securely hold over 100 pieces of drying equipment. Additionally, each side of this custom wrapped trailer becomes your company branded billboard whenever it’s rolling down the street or parked on the jobsite. The Ultimate Drying Station | UDS-76 Trailer is sold turnkey, fully equipped to your specifications. 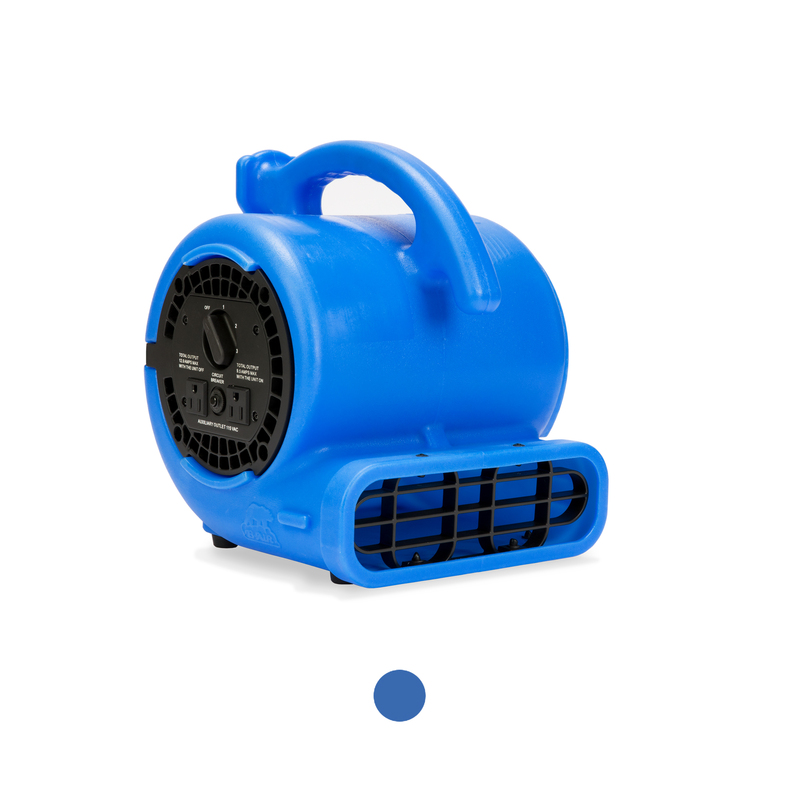 You decide the layout, the number of air movers and dehumidifiers you need along with your logo and design. We’ll do the rest. As a water damage restoration professional, you have to be prepared to face a wide variety of scenarios; from clean water damage from a burst pipe to flood damage that includes sewage contamination. These scenarios require a multitude of specialized equipment pieces to restore residential and commercial buildings that have suffered damage from water, fire, sewage, and mold. The best restoration companies have two things in common. They know where to source the proper water damage restoration equipment, and they employ professional people trained to use it. Commercial water damage restoration equipment like air movers, blowers, dryers and dehumidifiers aren’t only for flood cleanup. Remediation after a fire requires top-quality air movers, commercial dehumidifiers, and air scrubbers as well to dry the affected areas after fire departments have used large amounts of water to put out the fire, and to remove smoke and soot particles from the environment. Mold remediation often requires similar equipment, as mold is often found in damp or water-damaged environments. 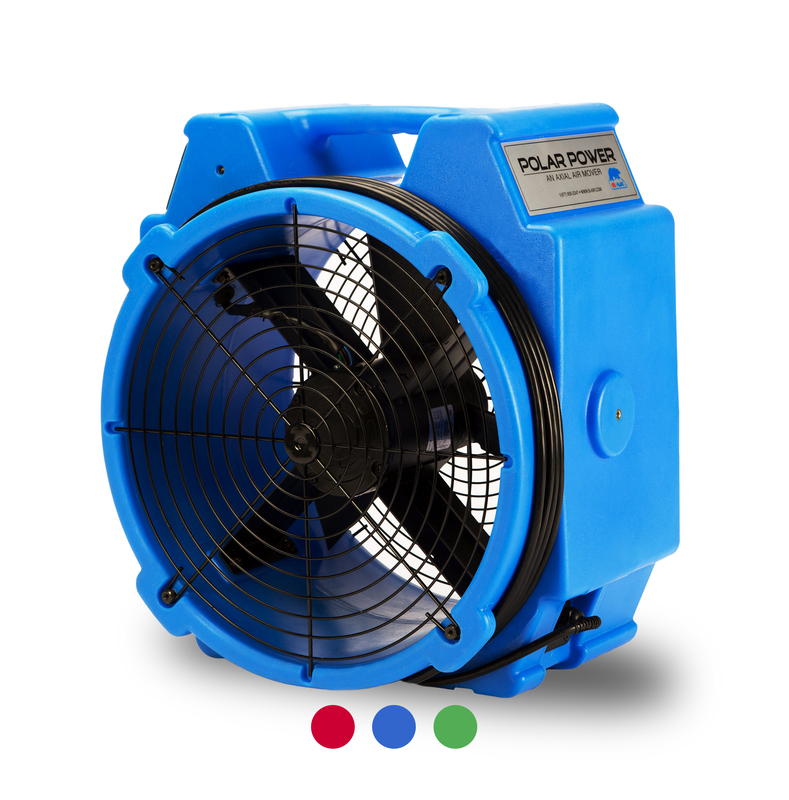 Commercial-grade air movers offer high-velocity airflow and fast drying, both of which are critical in any restoration scenario. 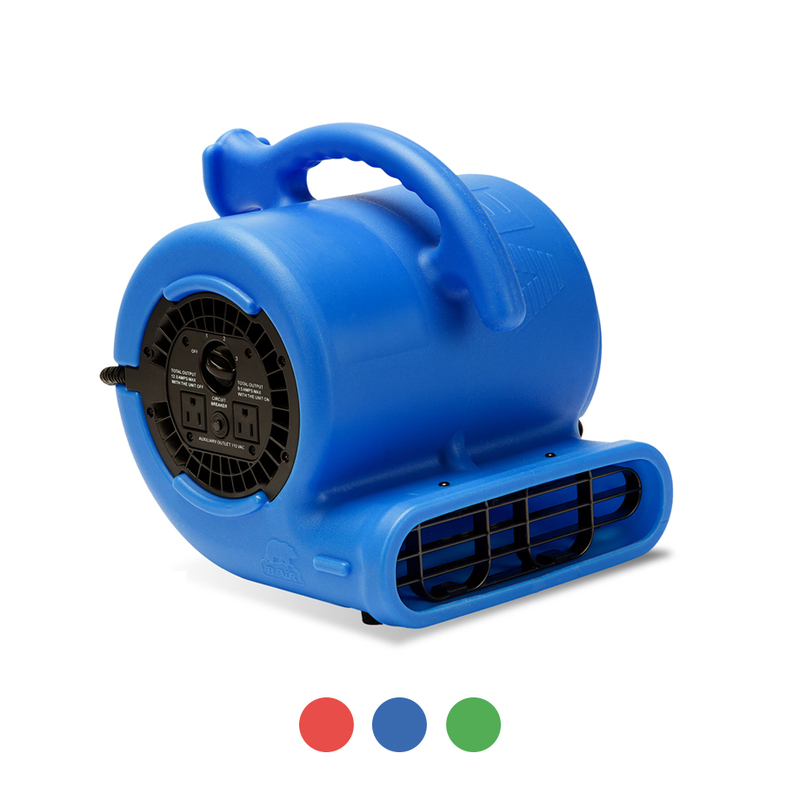 They are also intended for frequent and long-term use, whereas lower quality air movers not intended for professional use may fail if used for an extended period of time. When you invest in commercial air movers from B-Air®, you are investing in 20 years of engineering and design innovation dedicated to bringing you the most durable and reliable water damage restoration air movers possible. Whether you need industrial carpet dryers to restore an apartment complex or a small compact air mover to help dry out a crawl space, we have what you need in our inventory. B-Air® manufactures two types of air movers; axial and centrifugal air movers. Centrifugal air movers create airflow by leading the stream of air through a series of tubes and ducts, and using a fan wheel to do so. They are usually used applications that require high pressure, including air conditioning and where extreme drying power is needed. 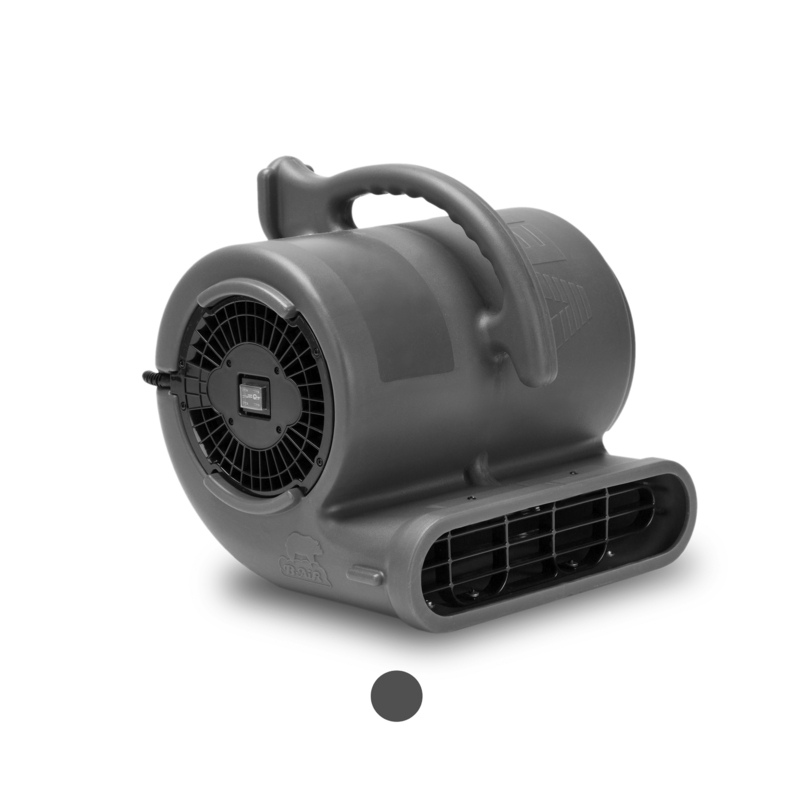 Axial air movers offer a more modulated, but less powerful airflow. In the case of the axial air mover, air volume is high but the pressure is low. These are commonly used to provide airflow in stuffy spaces or to cool technological equipment. They can also be useful for drying more delicate materials or for when noise is a consideration and the damp materials are not highly saturated with water. Motor Horsepower — We use horsepower as a measure of how powerful machines like air movers are. Each individual unit of electrical horsepower is equivalent to 746 Watts. 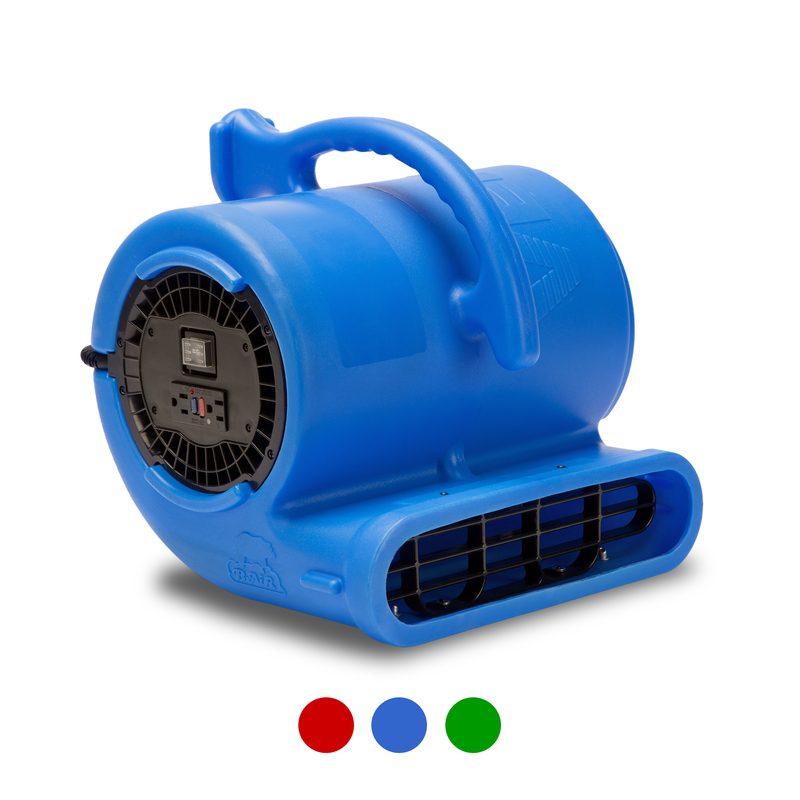 We offer air movers ranging from ¼ to 2 HP. Durability — The restoration equipment that you purchase has to withstand hours of use in rugged environments and transportation to and from different job sites. Make sure that the housing and components of any air mover that you purchase can handle the type of environment that you work in. All B-Air equipment is engineered to work in commercial environments, sometimes for days at a time. It is made from durable components inside a rortomolded plastic housing. Amperage — Amps is the rating for the amount of current or draw an electrical device requires to start up and operate. The amount of amperage a dehumidifier or blower requires affects the loading on an electrical circuit within a building. The circuit rating in a building that you will be working in can be an important consideration. Need to purchase equipment in bulk? Call us and ask about our wholesale air mover buying options! Commercial Dehumidifiers are crucial in restoring water damaged properties. They remove airborne moisture and prevent additional condensation, helping to dry the environment. 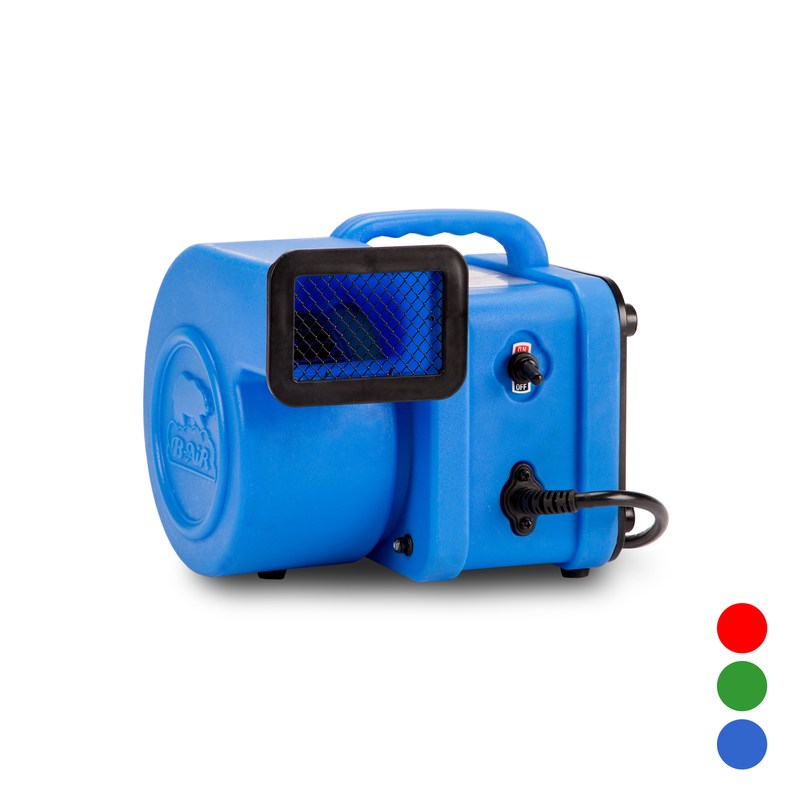 When used in conjunction with industrial air movers they provide an ideal solution for drying a water-damaged environment so that it can be repaired. Conventional Dehumidifiers – These types of dehumidifiers condense water vapor by passing the air over refrigerated coils, using a heat pipe to prevent frost from forming. These models are suited for most water damage restoration jobs as they are very easily transported from place to place, and tend to be less expensive than the LGR models. 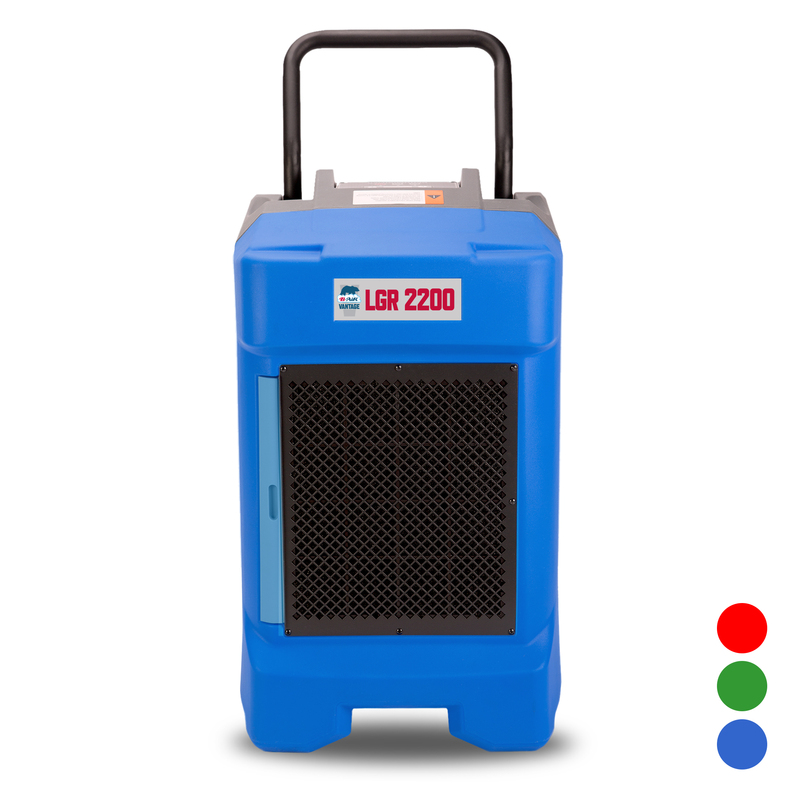 LGR dehumidifiers – LGR, or low grain refrigerant, dehumidifiers use a double cooling system that lowers the temperature of moisture-filled air once it has entered the machine. This leads to more condensation forming on the coils inside the machine, which in turn leads to more moisture being extracted from the air and less moisture that reenters the room when the air passes back out of the machine. LGR dehumidifiers remove more moisture from the air, making them the better choice for more severe water damage projects. You’ll hear the terms “AHAM” and “saturation” used in rating the performance commercial dehumidifiers. These standards are intended to help you understand the machine’s capabilities so that you are able to select the right dehumidifier for your work. AHAM is an acronym for the Association of Home Appliance Manufacturers. AHAM ratings refer to expected performance at what are considered “average” conditions – 60 percent humidity and 80 degrees Fahrenheit. AHAM ratings are believed to present a realistic picture of how equipment will perform in an “average” environment. ratings are taken at average conditions, which are dictated to be 60 percent humidity and 80 degrees Fahrenheit. So, if a dehumidifier is rated at 75 PPD AHAM, that means that you can expect it to remove 75 pints of water per day at AHAM conditions. A saturation rating represents a dehumidifier’s capabilities in an environment when much higher levels of moisture are present. Saturation ratings are measured at 90 percent humidity and 90 degrees Fahrenheit. These types of extreme conditions will not often be seen in the field, but they are intended to give you an idea of a commercial dehumidifier’s maximum moisture removal capabilities. A saturation rating is taken at 90 percent humidity and 90 degrees Fahrenheit, which represent much more extreme conditions that won’t often be experienced in the field. Because they serve different purposes, you will see both of these ratings on the dehumidifiers that B-Air® offers. For example, the B-Air® Vantage VG-1500 dehumidifier was rated in both AHAM and saturation tests. It is capable of removing 76 pints per day (PPD) at the AHAM 60/80 conditions while it can remove 150 PPD at the 90/90 saturation rating. Air scrubbers remove particles from the air, preventing lingering odors and airborne contaminants from remaining in a flood, fire, or mold-damaged area. The most important consideration when choosing a water damage restoration air scrubber is the filtration system, as this is what determines the performance of the machine. 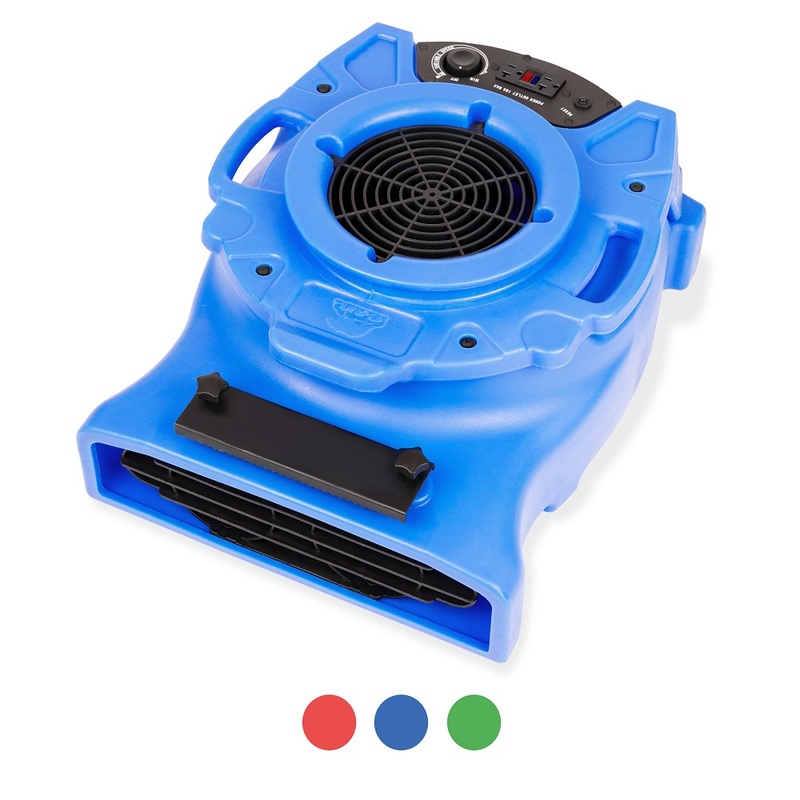 Air scrubbers are ideal for restoration projects as their HEPA filters remove the smallest particles from the air, which if left behind could leave illness-inducing contaminants or odor causing particles; this is especially important in the case of a fire or water damage involving sewage. Portability – Consider the spaces you will be working in and the manpower that you have available for moving equipment. Quality and Durability – Having to repair or replace an air scrubber in the middle of a job will slow you down and affect the efficiency of your work, and possibly your reputation. Investing in quality air scrubbers will be worth it in the long run. 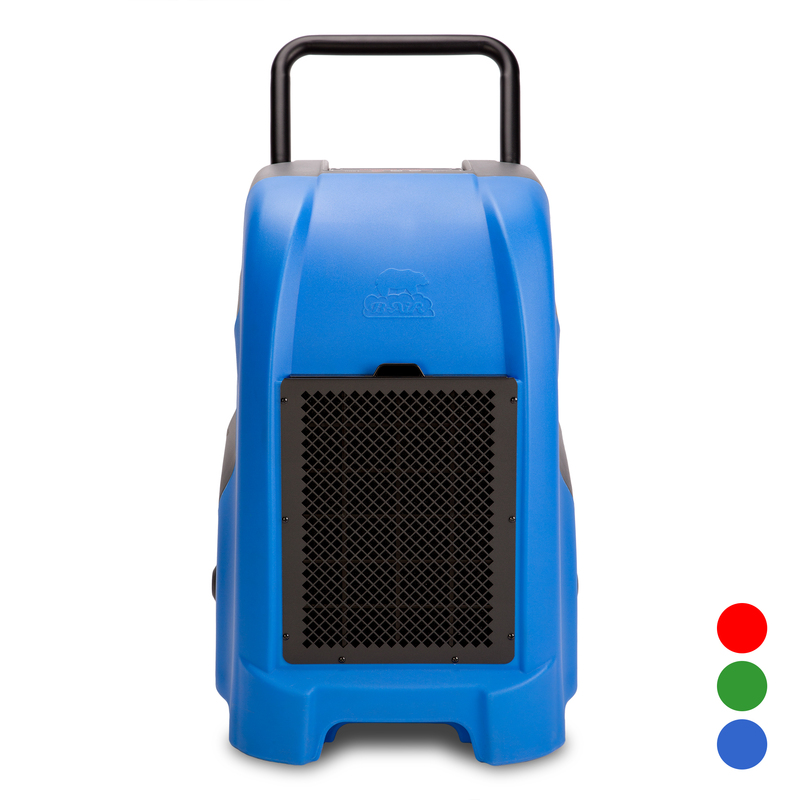 The B-Air® RA 650 HEPA air scrubber offers a nice blend of power and portability; it offers HEPA filtration and can be easily transported to your worksite. The water damage restoration industry classifies levels of water damage to help professionals assess remediation projects and follow the proper standards and regulations.  The industry is strictly regulated by the United States Federal Government under an administering body called the American National Standards Institute (ANSI). This administration addresses standards for the industry in a two-part document titled S500 Standard and Reference Guide for Professional Water Damage Restoration, called the S500 for short. One part of the S500 deals with practical standards for sewage cleanup, flood damage restoration and water mitigation. The second part is a reference guide that lists the recommended steps. Personnel and companies trained in S500 procedures receive recognized accreditation from ANSI through the Institute of International Cleaning and Restoration Certification (IICRC) program. Category 1 Water Damage — This is “clean water” that originated from a potable and sanitary source that’s fit for human consumption. There is no health risk. Sources are usually ruptured supply lines or natural rainwater leaks. Category 2 Water Damage — This is “gray water” or “significant contamination” water that contains some contaminants making it unfit for drinking. It could pose a potential health risk if consumed. Sources could be ruptured storage tanks, dishwater or ground seepage from hydrostatic pressure. Category 3 Water Damage — This is “black water” or “grossly unsanitary” water that is highly toxic. It poses a serious health risk to exposed workers who are unprotected. Raw sewage, chemical spills or brackish river overflows are examples. One category of water damage can quickly manifest itself into a more serious threat depending on the amount of water, the length of time it sits and the environment it’s in. Wet, warm, enclosed areas are perfect places for pathogens like mold spores and bacteria to flourish unless prompt remediation is done. To help the industry assess water damage intrusion situations, the S500 broke these three water damage categories into four classifications. Class 1 — This is where minimal amounts of water are on low-porous materials and present little risk of seeping in and presenting long-term remediation. An example is a burst residential hot water tank on a sealed concrete floor. Class 2 — This would be a significant spill onto medium- or high-porous materials, and the absorption can cause considerable damage. A broken pressure line inside an enclosed wall is a good example. Class 3 — These spills are large and in areas where evaporation or drain-off is hard. They quickly invite structural damage and toxic cultures. For example, a broken water main flooding a crawlspace would be Class 3. Class 4 — Worst-case examples like sanitary sewer back-ups or leaked chemical storage tanks would be Class 4. Restoration to this class of water damage could be challenging and dangerous. These categories and classifications let water damage restoration professional quickly identify their scope of work as well as the recommended steps they need to take for efficient and safe remediation. They also help to determine what pieces of water restoration equipment they will need. Whether your water restoration needs are for flood restoration, fire damage, mold remediation, or all of the above, B-Air® has all the commercial air movers, dehumidifiers, and HEPA air scrubbers you need to get the job done. 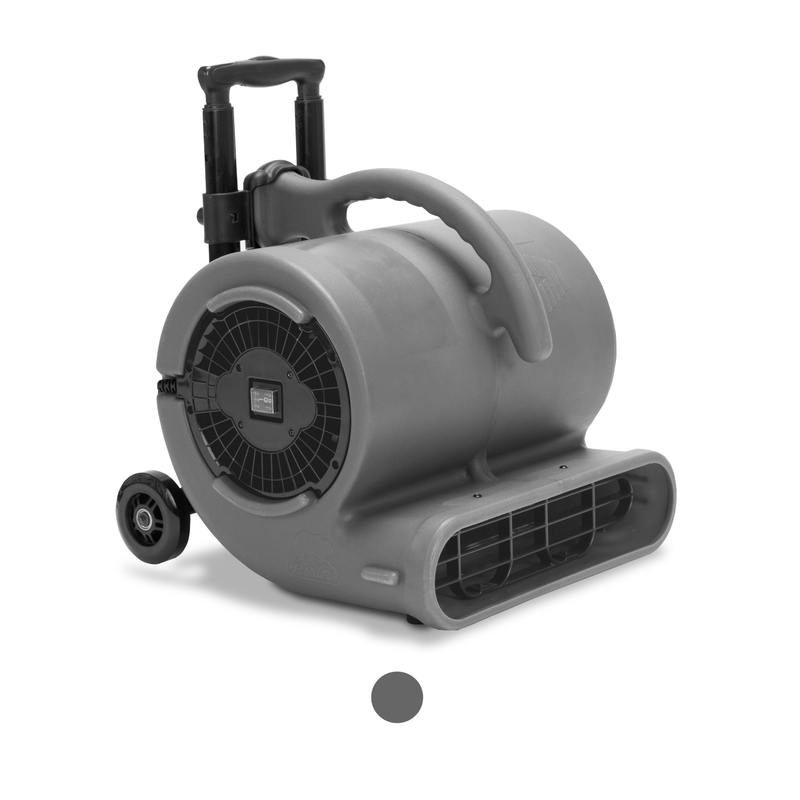 We have been manufacturing water damage restoration equipment, along with other products such as inflatable air blowers and commercial pet dryers, for over 20 years. This means that with every B-Air® product that you purchase, you are getting two decades of experience in restoration equipment design and engineering and a company dedicated to innovation and quality. Looking to buy in larger volumes? Ask one of our knowledgeable reps about our bulk options available to restoration professionals that will save you money on equipment costs. For all your water damage restoration equipment requirements, contact B-Air® today.